DynaBeans are the extensibility and flexibility according to the incoming request, defining even the simplest JavaBean requires defining a new class and coding a field and two methods for each property. The property of DynaBean can be configured via an XML descriptor, its property can't called by a simple java method but work well with reflection and introspection component. In this chapter, we have create a very simple DynaForm Example with struts. This Example design in NetBeans IDE- 6.8 with Struts 1.3. 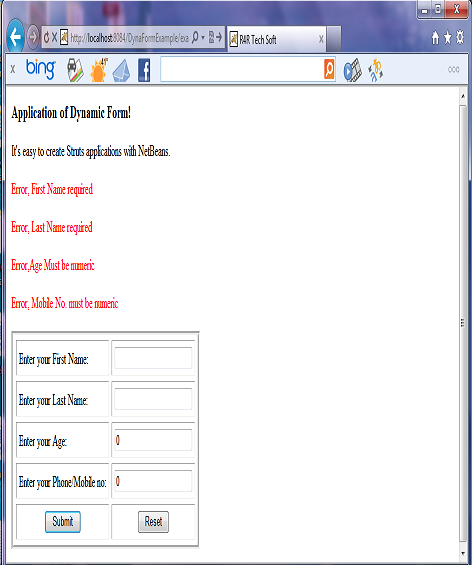 A Subclass of DynaActionForm class which play virtual role of ActionForm class. one Action file name as LoginAction.java, used for provide specific processing functionality. Step- 1: Start your IDE (NetBeans 6.8 with struts 1.3). Step- 2: Open a new project( Crtl+Shift+N), name it , add server( Apache Tomcat 6.0.20 ), then add struts framework 1.3 , and don't forget to add Struts TLDs. Note:-When you click Finish button, NetBeans IDE put and configure everything in place and project open in your IDE. Step- 3: Open welcomeStruts.jsp page from your struts application and code it as describe below. Step- 4: Open success.jsp page from your struts application and code it as describe below. <p> First Name:<strong> <bean:write name="DynaExample"
<p> Last Name: <strong><bean:write name="DynaExample"
Step- 7: Open ApplicationResource.properties place in com.myapp.struts package, this file act as resource bundle of application and used to provide the property and validation into application. 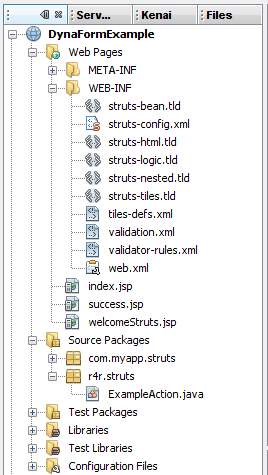 Step- 8: Since we Already Add property into DynaForm form struts-config.xml file. so no need to design Bean class. 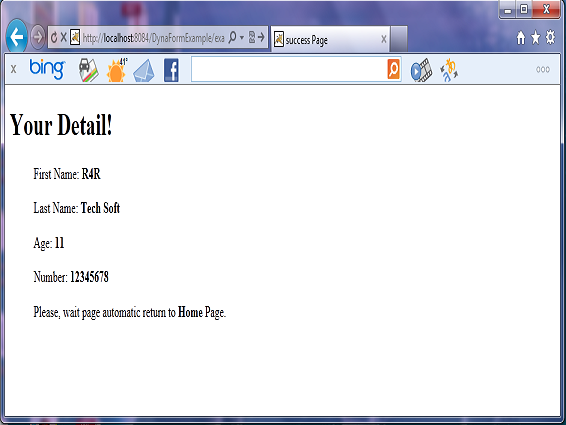 Action class automatic call all the property from DynaFrom. 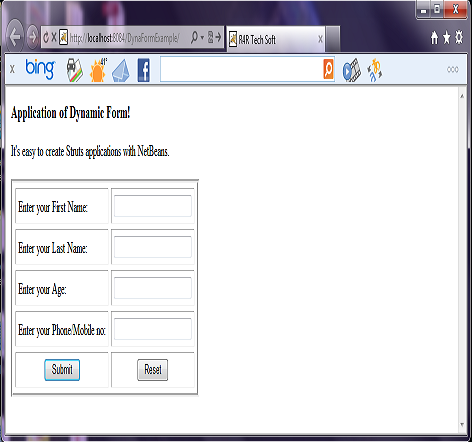 Step- 9: DynaForm directly access the Action class of servlet by its instance. Note:-Now your application is complete, so now start run your application. Start your server( which you embedded when configure our struts application), then right click your application and click upon Run option or open your welcome( index.jsp) page and press shift+F6.